The NEIP – Interdisciplinary Group for Psychoactive Studies – was founded in 2001 and is a center for study of psychoactive substances that brings together scholars in the Human Sciences affiliated with various institutions to promote joint reflection on the topic. The NEIP has functioned above all as a space for academic dialogue useful in developing our own research. Until now, our most important efforts have been: the creation of two university extension courses on current day perspectives in the study of drugs during the first semester of 2003 and the second semester of 2006, in the Department of Anthropology of the FFLCH of USP; a symposium on drugs at the Department of History of FFLCH of USP in 2005; a debate on the legalization of drugs that was held in the Department of Anthropology of FFLCH of USP in 2006, the publication of the book “Drogas e Cultura: Novas Perspectivas” (“Drugs and Culture: New Perspectives, Edufba/MinC, 2008) and the Congress “Ayahuasca and the Treatment of Dependency” at the Department of Anthropology of FLLCH of USP in 2011. We seek to establish an ever-greater presence in public debate about the “drug problem,” arguing that the Human Sciences have a fundamental role in this area generally dominated by health professionals and by positions often marked by biased tendencies. Our theoretical approach does not exempt us from recognizing the necessarily experimentalist position and is characterized principally by interdisciplinarity among diverse knowledges, be it among the fields of history, sociology, and anthropology, or in their dialogue with psychology, economics and the arts or even in the more general domain of philosophy. Finally, as researchers we feel compelled to take a political and ethical position toward the contemporary drug question: we declare ourselves directly opposed to the reigning, global-scale prohibitionist regime. To whom do our experiences, our minds, our desires belong? Who has the power to regulate our journeys, to guide our inner quests? Are our lives and our times, in fact, ours? Almost a century ago a majority of the world’s States came to affirm that these journeys of ours were not ours alone, but implicated them as well. In the name of a supposed “general wellbeing and security,” birth, death, life, reproduction, and relationship-human events par excellence-were transformed into the target of totalizing, political, external control. Experiencing one’s own existence ceased to be something that depended on individual choice or groups of local solidarity (family, community, religions). The uses of psychoactives for reasons of religion, self-knowledge, or hedonistic pleasure come to be classified-by the State and by the “society” it represents-not just as abnormal and dangerous paths, but also as illegal and in constant threat of prohibition. Moral condemnation gained the status of legal proscription, entailing the capture and prosecution of those who want their bodies and minds at their own unqualified disposal. The central objective of drug prohibitions is to banish them from human society forever. We know, however, that humans have interacted with consciousness-altering substances for millennia, always finding ways to govern their use and abuse. The “definitive destruction” of these habits has been sought for a mere hundred years-a search that can only increase harmful uses, besides literally producing an enormous and powerful illicit market: narcotraffic. The individual passions and the cultural manifestations related to the use of psychoactives thus fall into the pool of “spurious acts” that must be regulated by a State that rises up to be the defender of society. The intolerability of this situation is the common denominator that sustains the NEIP, which is simultaneously dedicated to intelectual work, research, and political intervention. The various scholarly perspectives on the theme of drugs find common ground here: fierce criticism of prohibitionism and the ethical defense of individual and collective experiences with psychoactives, understood as legitimate social and human attitudes. The target of the NEIP is prohibition and its mission is to problematize the theme of the illegality of drugs, calling attention to the social and political effects of a war against such substances which is, in fact, a war directed at social groups, individual habits, and secular customs. From this attack is born a defense of the position that men and women may choose their own guidelines for using psychoactives according to their existential needs. It is important to emphasize that we do not have unanimity of vision, a formula or legislative and policy solutions about drugs (e.g., “legalization,” “decriminalization,” “regulation,” “liberation,” etc. ), nor do we argue for total and direct alignment of positions, associations, and networks connected to the theme at the national and international levels. Above all, we have a commitment to scientific research on drugs, trying to abstain as much as possible from preconceived notions and maintaining an attitude of contant reflection on the subject. The NEIP embraces diverse political and theoretical positions on drugs, and it is precisely this diversity that builds up our reflections. A point of agreement among our members is the questioning of the international division between licit and illicit drugs, and the affirmation that the “drug problem” is the result, in the first place, of the current “war on drugs” policy, as well as the defense, on ethical grounds, of the dominion of the individual over his own body-including in this the use of psychoactive substances as a means of altering sensations and perception. In a word, we are anti-prohibitionist, which does not imply a simple “pro-drugs” position, and still less an apologia of drug use. The dialogue between the NEIP’s researchers takes place through an email group where we share news and commentaries related to our theme and discuss the groups’ activities.The pages of this site are intended to extend the NEIP’s discussions to a wider public, propagating our positions and the results of our studies, as much through the individual work of our members as through the exposition of courses, seminars, and other kinds of academic events that we hold. On our site can be found articles, reviews, interviews, and notes from the NEIP’s researchers; we are also open to receiving contributions from other investigators of the topic of psychoactives who are in tune with our general presuppositions. The NEIP is also open to the opportunity to find new partners and interlocutors inclined to join in the permanent agitation that galvanizes, mobilizes, and seduces us around the urgency to rise up ethically and esthetically, defining spaces of liberty and taking the reins of our existence. 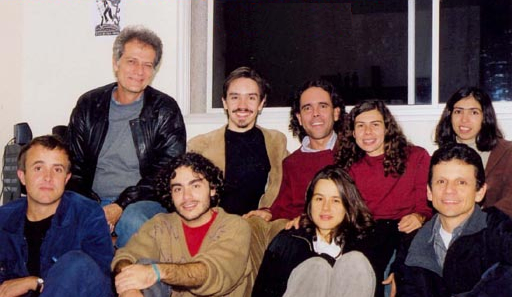 Foundation in 2001: (back from left to right) Edward MacRae, Thiago Rodrigues, Henrique Carneiro, Sandra Goulart, Silvia Miskulin; (front from left to right) Guillaume Pfaus, Mauricio Fiore, Beatriz Labate, Walter Varanda.